Q1: Of the following choices, which is the best way to appeal to Millennials? Q2: Of the following choices, which is the best way to appeal to affluent crowds? Q3: Who are the most avid coupon users? Wow, those are some serious stereotypes. And while it would be awesome to have an unlimited flow of pop tarts and someone to drive around your driver’s driver, those are probably not reasonable for a business to offer people of those respective generations. In truth, the correct answer to both Q1 and Q2 is the correct answer to Q3. 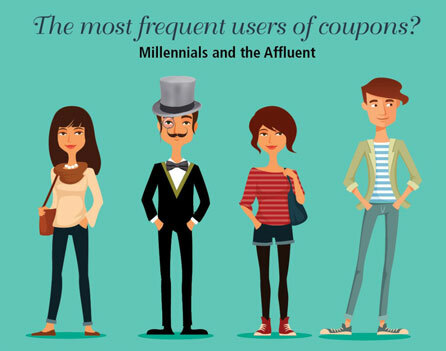 Millennials and the affluent are the most voracious coupon-using demographics in the marketplace today. It’s odd to think that the key to catching the fleeting attention spans of Millennials is coupons, but research shows that as many as 96% of Gen Y uses them. When one takes into consideration their debt and struggle to find gainful employment, it makes more sense. The advent of mobile coupons may be the biggest driver of their pro-coupon attitudes. This is a group that lives on their phones, and 65% use those devices while shopping. It’s a natural fit. You’re probably not surprised at Millennials' desire for savings, but the pro-coupon habits of the wealthy may have taken you for a twist. 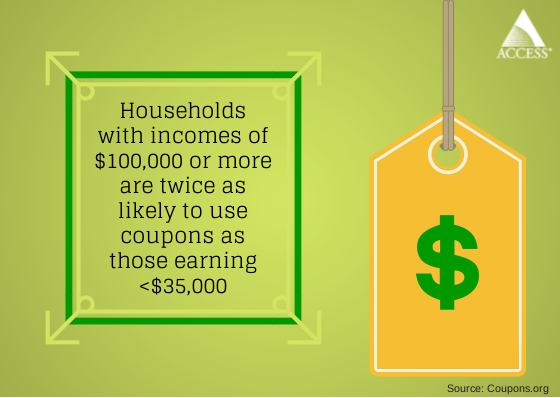 Two years ago, a now-defunct organization called coupons.org reported that households with incomes over $100,000 were twice as likely to use coupons as those earning under $35,000. Similarly, another survey found that 74% of U.S. adult online shoppers with annual household incomes of $75,000 or more use online coupons, compared with 59% of those under $35,000. Think of the wealthy people you know. Most of them live comfortably because they were shrewd with their income. They may not have invented Instagram or Oculus, but they made wise decisions, like buying used vehicles instead of new ones. It's how they amassed their wealth and how they'll keep it. These days, saving money and using coupons is across the board for basically every demographic. Everyone is feeling the crunch and companies know that price outweighs brand in the minds of many consumers. But if your interest is in connecting with young professionals, or the wealthy, then don't invest in free "ironic corduroy pants" or "water fountains that dispense Dom." Your best bet? Ditch any preconceived notions and look to the old standby: coupons.